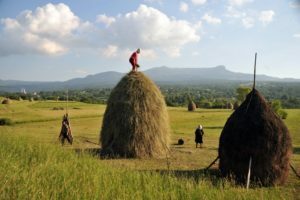 Large forest lands and grazing areas are currently managed in associative ways by community-based institutions called obști and composesorate, all over the Carpathian Mountains. Up to 1,300 commons covering 786.000 ha of forest, 12% of the forested area of Romania, are stewarded by 600.000 members. How do local actors use the commons? How do people think about the commons? What is a successful common? How do social actors govern their own resources?